Having set performance standards worldwide with the renowned sport touring BT-020 NT , Bridgestone has now gone one better. Its successor, the new Battlax BT-021, is a true luxury sport tyre, with confident front-end feel, high stability both on motorways and winding roads, strong grip on wet and dry, and plenty of shock absorption for comfortable long journeys. It beats BT-020 performance on all major criteria, including higher mileage in all riding modes. 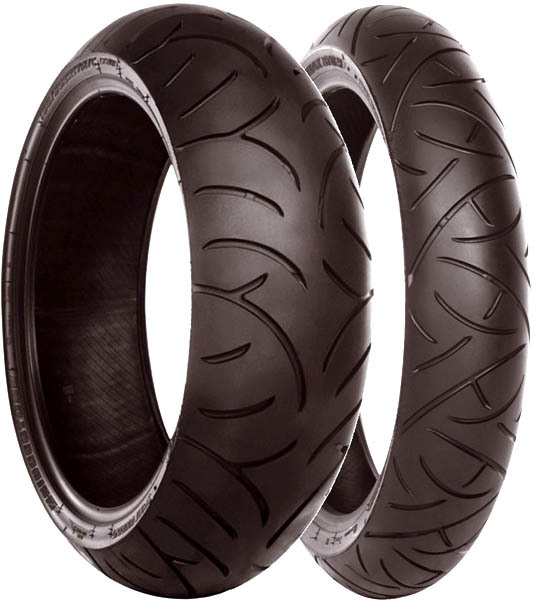 The BT-021 is Bridgestone’s first line of products to use MSB Mono Spiral Belt on both front and rear tyres. With optimal stiffness provided by the HTSPC High Tensile Super Penetrated Cord , this MSB construction raises stability and shock absorption to the highest levels. The distinctive new slash pattern design with wide crossing centre grooves on the front tyre gives top-quality handling and steer precision. Mileage tests also show significantly higher resistance to irregular wear than the BT-020 tyre it replaces. The rear tyre SACT Straight and Cornering Technology tread construction with Cap & Base technology and dual compound tread provides plenty of cornering control from the high-grip shoulder compound, while the firmer centreline and base layer produce the necessary tread stiffness for improved traction and mileage. Stability and cushioning are enhanced by a newly-developed outside bead filler in the soft two-ply construction. For the rear pattern design, a low negative ratio in the centre puts more rubber on the road, adding mileage and durability while reducing pattern noise from air bumping. The new Battlax BT-021 is designed to provide a wide range of heavier sport touring motorcycles, from 600 cc to 1200 cc, with the highest possible levels of comfort at speed and an exciting feel through corners off the highway, in all conditions. Available in 5 front-wheel sizes and 7 rear-wheel sizes from January 2007, it will steadily replace the current Battlax BT-020.